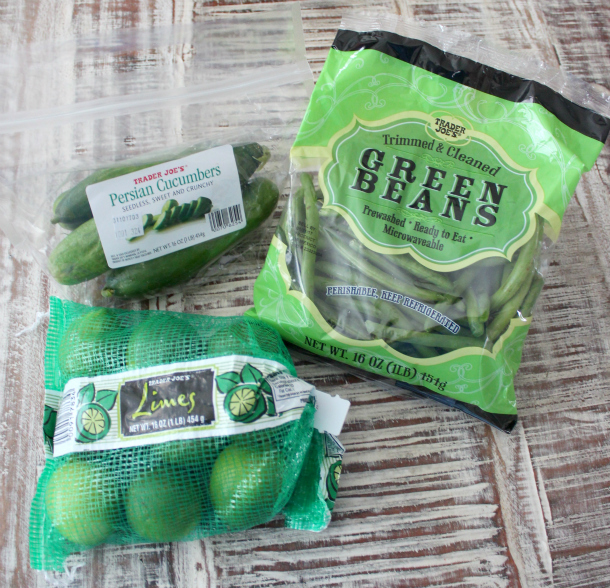 My Trader Joe's Favorites - What are Yours!? Before you ask or think it, NO, this isn't sponsored and YES, I paid for everything myself. 😘 I just wanted to share some favorite food finds of mine! 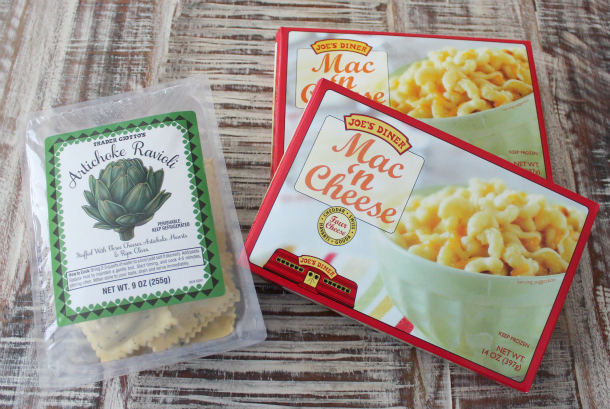 It's no secret that tons of us are obsessed with Trader Joe's. How can you NOT love their gourmet (yet super affordable) frozen food selections and endless unique, AMAZINGLY delicious snacking options... not to mention their fresh produce, that I swear has the cutest packaging. If you've never been, it's a MUST. I wouldn't say it's a store where you can do ALL of your shopping... because heaven knows Momma needs Costco's 'bulkness' and Walmart's prices to complete her life's list of necessities. 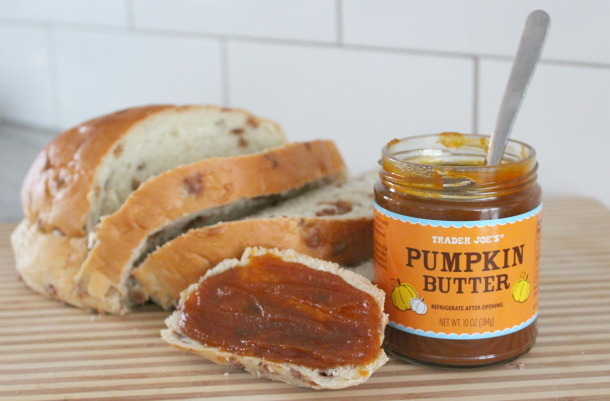 But for GREAT deals on yummy specialty foods (without the "specialty" price) and the BEST selection of flowers, Trader Joe's is SO my jam! So... I figured that I would share my favorite things, because who isn't curious as to what people love from the same stores you shop at! Am I right!? So here we go! 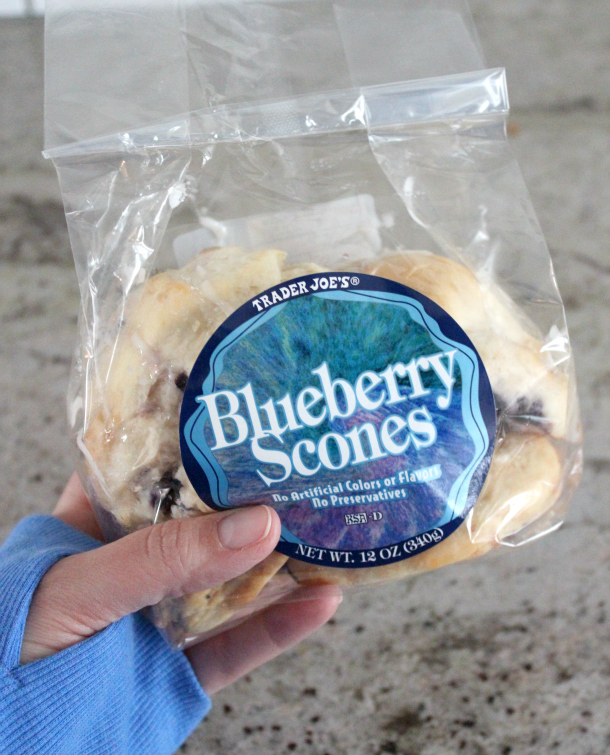 Scones are just... freakin good. And these ones aren't too sweet and aren't too dry. Plus they have yummy blueberries throughout. Fresh and SUPER fast to cook. Plus, they literally only need a dab of grass fed butter and parmesan... so it's basically the easiest lunch or dinner ever. Super crunchy, sweeter than regular cucumbers and only like $2. Pair them with a drizzle of olive oil and balsamic glaze (we'll talk about that in a sec) and you've got a fancy side dish people! Pop those bad boys in the microwave, add a bit o' butter... easiest, healthy side for basically any dinner. Because Diet Coke 😬 ... oh, and they're just cute in this lil' bag, right? It just tastes better. Promise. Grind some up and try it on something. You'll see. Like I said... with cumbers, but also with mozzarella cheese and tomatoes, with a bit of that pink salt and some pepper??? .... THE BEST! It's sweet and tangy, but thick enough to actually grab onto whatever you're eating, instead of making a watery mess like regular balsamic vinegar. 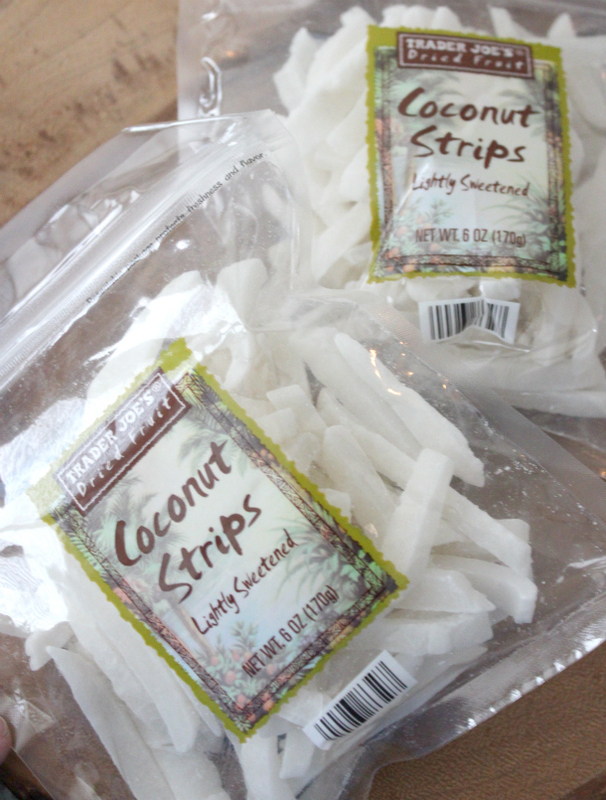 If you're a huge fan of raw coconut like me, try these. They're delicious! A bit fibery, definitely not "candy", but they can kill a sweet tooth with just a strip or two. Probably my ALL TIME FAVORITE thing at Trader Joe's. They're less than $2 a bag and holy crap, it's like a grown up potato chip. SOOOOO good, and I can totally polish off an entire bag myself if I'm not paying attention - they're THAT good. Plus, I'm pretty sure you can eat them on some of those particularly picky diets. I'll be honest, I'm a frozen food snob. It's like... I sample it at Costco or wherever, but then once I get home and make it, it NEVER tastes the same. Soggy, dry or just not good. 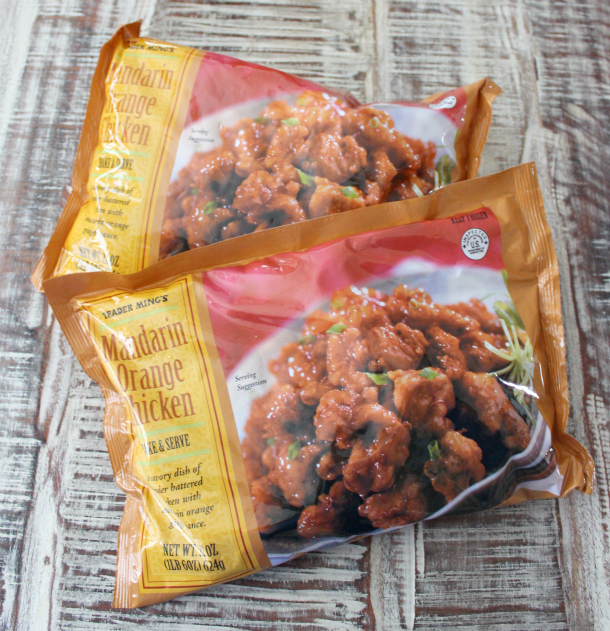 BUT, this Mandarine Orange Chicken turns out AMAZING every time, and my kids LOVE it! I cook the chicken in the oven, and it's always crispy on the outside and tender on the inside. The sauce is slightly sweet and has a tang to it, but not so much that it's not kid friendly. Also, the sauce is in packets, not on the chicken, so if you want to pull some plain nuggets out before the sauce goes on, for pickier eaters... easy! 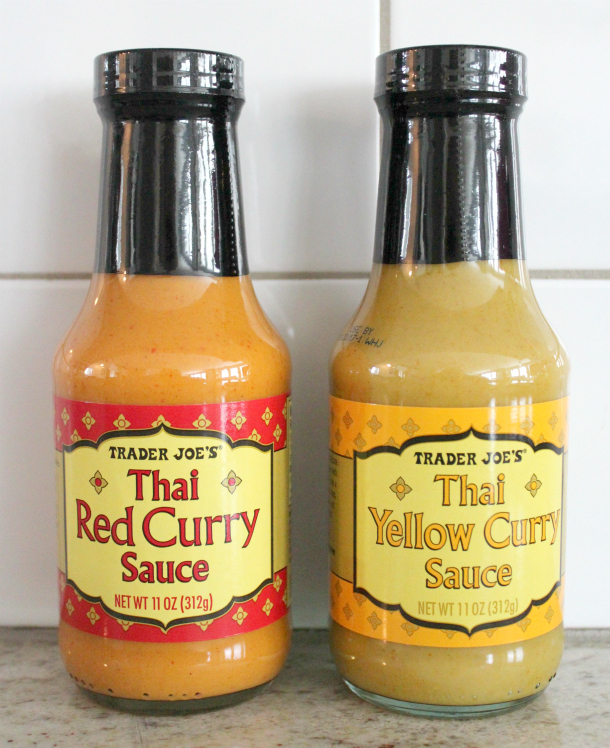 The bottled curry sauces at Trader Joe's are REALLY good. I just sear up some chicken and pour it on. Then throw everything over rice. Easy peasy. Honestly? 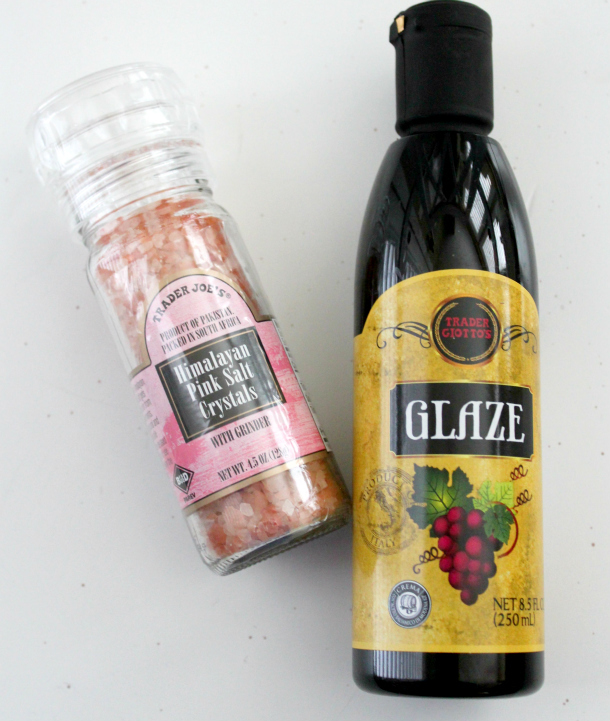 I usually combine these bottles together to make a custom sauce. Not sure why I started doing that, but it's yummy. Ooo, I forgot to get some, but they have a REALLY good thai peanut dipping sauce too. Sometimes I add a splash of that in as well. 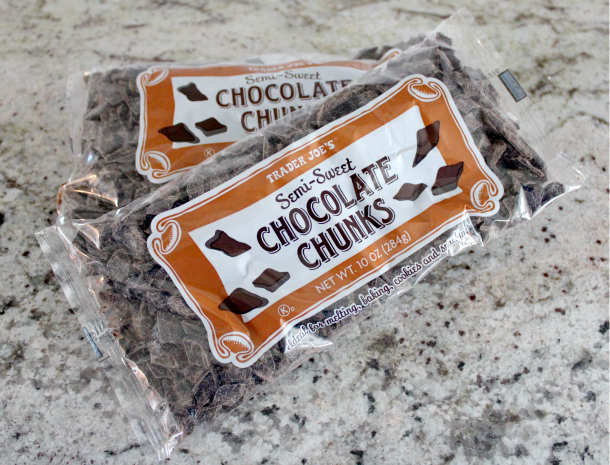 Super low calorie and PERFECT for after dinner when you don't have a stale pan of brownies to pick at that was leftover from Sunday night. (come on, you know you do that too). You could totally make these yourself, but for under $2 a box, it's so not worth the mess and time. The only cookies that are allowed to be hard are Oreos and Thin Mint Girl Scout cookies. All others should be amazingly soft, and these two are no exception. 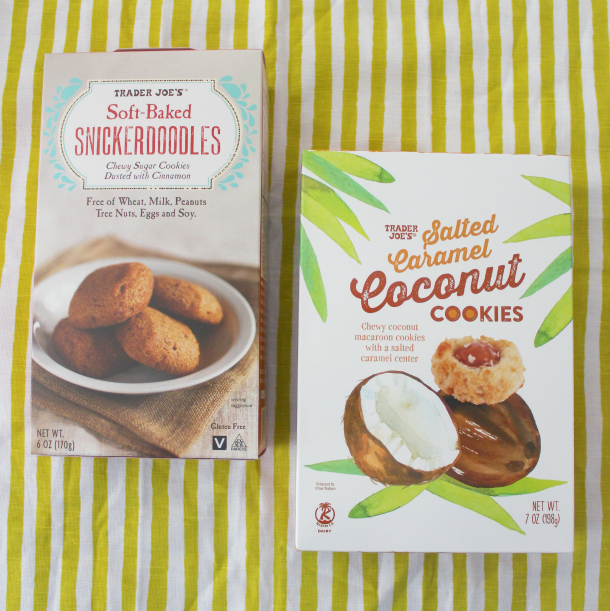 And the coconut cookies are basically a freakin' amazing coconut macaroon with a slab of salted caramel in the center. yesssssss! I have yet to try them in my all time favorite cookie recipe, but you better believe I will be! Whew! Okay, so those are my must haves... now... tell me YOURS! 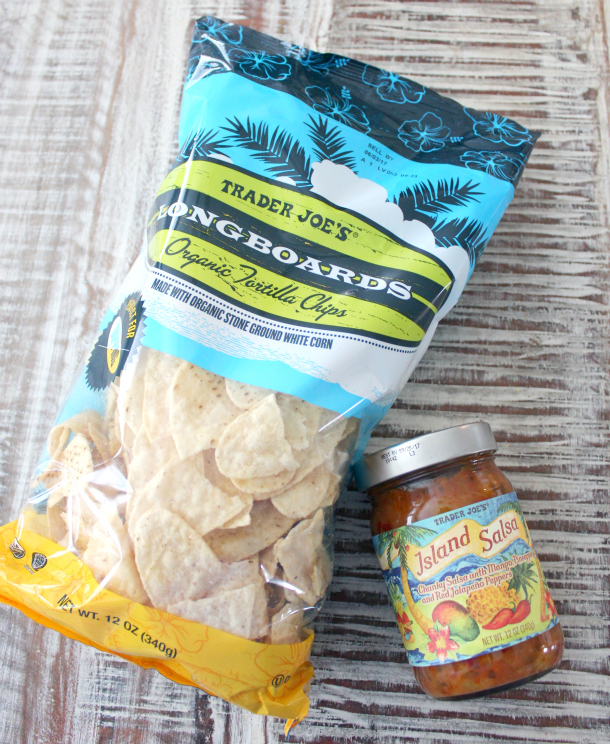 Don't be shy, fill me in on what your Trader Joe's Favorites are! I'm always on the lookout for yummy additions to throw in my cart! Ditto Jenelle! Love the dark chocolate almonds with turbinado. And, the microwaveable brown rice (in frozen foods section). Um, the garlic salt in the grinder is like, not even real. If I'm cooking meat, I'm grinding. If I'm roasting vegetables, I'm grinding. If I'm making garlic bread, I'm grinding. Grind with me. The boxes of frozen brown rice packets are my number one tj's staple. Such a boring thing, but I will never consistently make rice that good. They take 3 minutes in the microwave and boom- perfect rice. Serve with mandarain orange chicken or their Cuban black beans. I probably buy at least two of those three items every time I go! Too hard to pick just one favorite! I also love their customer service! I love their "just chicken" breasts that are previoked and seasoned so you can cut and throw them on top of a salad no weird extra stuff added. 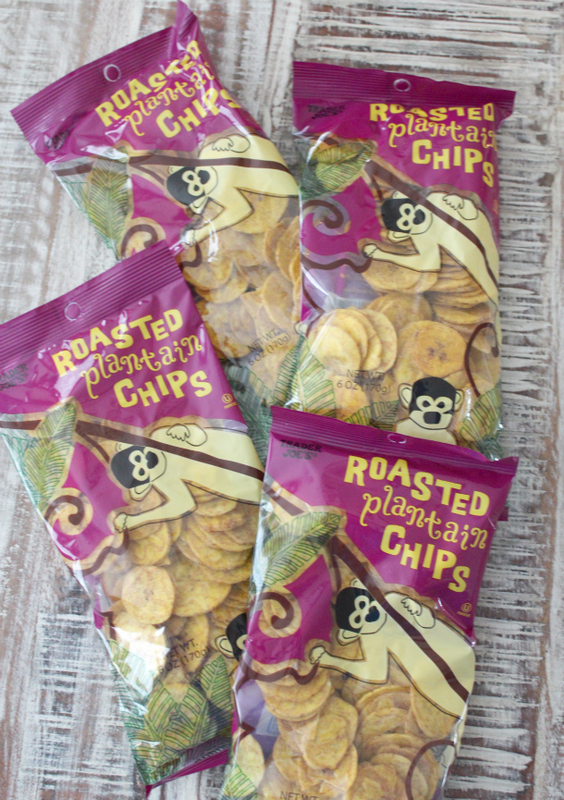 Love the plantain chips too. Gorgonzola and red sauce gnocchi is amazeballs. You can even mix them together. 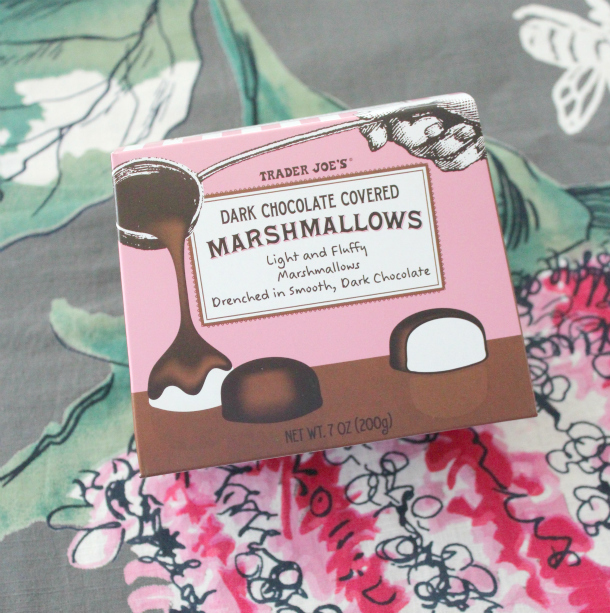 I pretty much love everything at TJ's! Their balsamic glaze is by far the best! 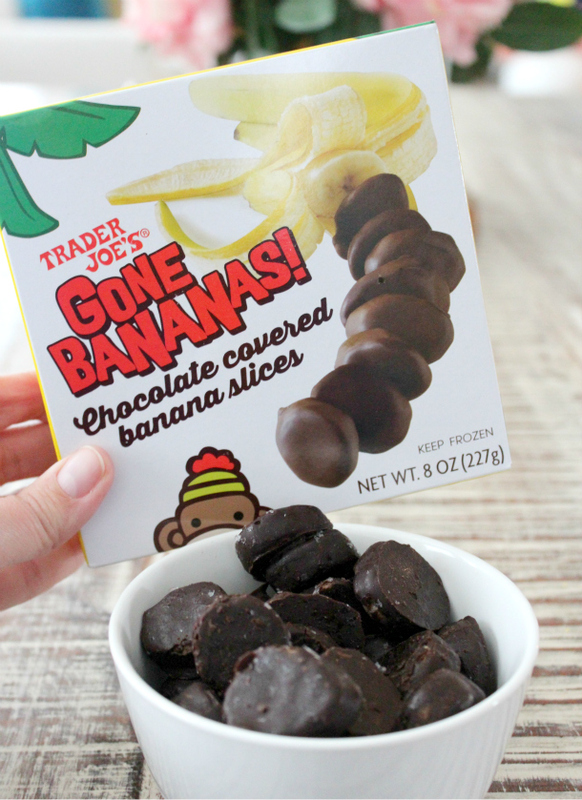 I put it on pretty much every veggie I cook :) And you clearly can't go wrong with the frozen chocolate covered bananas. I used to snack on those all day! manchego cheese and fig spread on any cracker. mushroom lasagna. eggplant lasagna. Wish I had TJ's in my town. Must drive 45 minutes to shop there so it's not often. Did go in over the holidays and my sister made me buy a box of Joe Joe Jingles....yum! Bought some beautiful boxwood wreaths for $10. Keeping my fingers crossed we get one in Greensboro NC soon!! The sweet chili sauce is amazing! Love Trader Joe's! I'm taking your list with me next time! I love their gyro meat, we make homemade gyro pizza with it, or gyros and homemade tzatziki sauce, so good! The hollandaise is to die for, refrigerator section. Marinara sauce. Love the wine too! We LOVE the JoJo vanilla cookies...for years it has been our "go to", I have a sweet tooth now and need just a little something. There isn't enough space here to complete my list...we do all our shopping at Joe's. Cookie Butter - takes some serious will power but angels sing when you eat this! Love the bags of raw pizza dough (you can freeze it) can't be beat for just over $1. The Danish Kringle!!! Get it!!! The creamy tuscano cheese soaked in syrah and pair it with the fig and olive crisps. Proof and bake croissants in the freezer section (i am a sucker for the chocolate ones)!! If you haven't tried this, you must SOON. Some yummy Yogurt, fresh fruit,good Orange juice, and warm croissants... Make a simple and impressive weekend breakfast.